Well known for its cultural heritage and the diversity of its landscapes, the UK is one of the most popular European tourist destinations. Come and discover the industrial charm of the cities in Northern England, but also the beautiful natural reserves of Wales and their love for the oval ball! You will be tempted by the Scottish distilleries as well as the various castles on the island. With a wide choice of vehicles, visiting the UK has never been simpler than with Yescapa. Choose your RV or conversion van, the dates of your trip and set off to taste some fish & chips and the tastiest cakes of your life! As an iconic and unmissable destination, the city of London is famous for its cultural diversity and its iconic monuments. 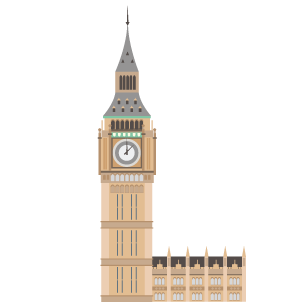 Go from Big Ben to the Tower of London while passing by the British Museum and the wax figures in Madame Tussaud's, the attractions are in league of their own and will not leave you feeling indifferent. If you're looking for a more secluded place, discover the treasures hidden in the city while taking a walk along the border of the Thames or in the passageways of Camden Town. Soak up the centuries of cultural mixing in Little Venice and the tranquility of its barges, or the atmosphere in Soho, a district which has long been a popular place among the Beatnik generation. Looking for more calm and tranquility? By travelling around Kent by RV, you can discover the green countryside scattered with many camping areas. Easily accessible from London in less than an hour's drive, Kent is nicknamed 'The garden of England' due to the large woody expanses and it is known as the sunniest region of the UK. Make the most of the large open spaces by visiting the towns of the surrounding area with their wooden houses or the impressive medieval castles, especially the castles of Rochester and Dover. The biggest Scottish metropole is famous for its friendly locals, its imposing buildings and its green passages that surround the city. However, not many people know that the city is considered as the curry capital of the UK, where you can taste Glasgow's many cultural dishes! Take a detour to the restaurants and bars on Ashton Lane, a legendary street in the city centre on which you can taste on of Glasgow's delicious recipes. You will also have the chance to marvel at the the city's majestic cathedral or relax in Kelvingrove Park. We recommend that arty types take a detour by Kelvingrove Art Centre or the Glasgow School of Art and its astonishing exhibitions. However, what would be a visit to Glasgow without a stroll through the heart of the most prestigious Scottish distilleries? Go and discover the secrets of Glncoyne or Auchentoshan manufacturing on an informative visit around a dozen miles out of the centre of Glasgow. Edinburgh is surprisingly close to Glasgow, which is why it seems impossible to leave the country without having discovered the two cities! Only an hour and half on the road away, Edinburgh is often more popular with tourists than its little sister, with plenty of attractions of all varieties. A free tour with a guide will allow you to discover the most renowned locations, notably Edinburgh Castle or the St Giles Cathedral. If you're a fan of photography and amazing landscapes, you should watch the sunset from the heights of Arthur's Seat, the hill famous for its many legends and breathtaking view that it offers. Quidditch fans and Bertie Bott's Every Flavour Beans will pleased that there is a Harry Potter walk, which will show you the iconic locations from the film series. During a moonlight walk in Leeds, the beauty of the city bathed in light strikes the eye. A large number of restaurants and bars are fully aware of this and offer the opportunity to dine opposite the large bays, allowing you to admire the sight. By day, you will find a warm and friendly atmosphere in the historic arcades of the city, where various shops have moved in. The Kirkgate market, a place with a festive atmosphere, is one of the biggest covered markets in Europe and will allow you to taste unforgettable dishes. Leeds is however much more than these shop and restaurants: surround yourself with greenery in Roundhay park and make the most of the vast maintained woody space to take a walk or go for a run, relaxation guaranteed! Whether you're a sport or a music fan, a detour by the First Direct Arena will surprise you; the building is a a mix of technological modernism and architectural audacity. You cannot visit Leeds without going for a walk in the heart of the Yorkshire Dales. This English national park dotted with green passages and exceptional surroundings extends to the counties of North Yorkshire and Cumbria. Many activities are waiting for you, like a visit to the Forbidden Corner near to Leyburn, a mysterious and intriguing place with a series of bizarre tunnels and statues that will enchant you! Continue on your journey to discover the Aysgarth Falls, gorgeous cascades of water located around 7 miles to the East of Leyburn that will guarantee an unforgettable walk. Looking for something more exotic? Treat youself to a visit to the underground caves of White Scar in Ingleton: this visit which lasts an hour and a half will amaze you with its majestic waterfalls and peculiar sights that have formed through erosion. The biggest tip that we can give you is to visit the Welsh capital on match day. Make the most of the friendly atmosphere of this joyous time and of this city that eats sleeps and breathes rugby! The biggest fans among you will enjoy discovering the millennium stadium with its retractable roof and go on an organised tour of the grounds. Many activities are at you fingertips in the heart of the city, depending on what interests you: The Chapter Arts Centre for culture vultures, the Cardiff Indoor Market for tasty discoveries or the Taff Trail, a 56 mile-long trail between Cardiff and Brecon. Pass by the Cardiff Bay to discover the Senedd, an amazing building which holds the National Assembly, as well as the Norwegian church with its low-profile and traditional design. The surrounding areas of Cardiff are just as attractive as the city and many exceptional places await you. Situated an hour away from Cardiff, the caves of Dan and Ogof offer magnificent underground landscapes, made up of breathtaking caves and historical reconstructions. Do you prefer open air activities? By immersing yourself in nature, you will find Pen and Fan, the highest mountain in the South of the Wales, which offers various hiking itineraries. With a visit to the Dare Valley Country Park, you can make the most of 200 hectares of natural space and many hiking paths, for days of ultimate relaxation. And if this isn't enough for you, Snowdonia, the biggest natural park in Wales, will welcome you with your RV for holidays closer to nature! Bristol is famous for its busy urban scene, from which some of the major groups on the English music scene of the last few decades have emerged, among them Massive Attack and Portishead. Here, as the home town of the artist Banksky, street art has prestige, with amazing pieces decorating all four corners of the city. The city organises the Upset festival every year, which is dedicated to the underground culture and uses the buildings of the city to to produce gigantic works of art which are well worth the detour! The hills to the South of the village are made up of an immense green space housing certain protected monuments, but also of sport terrains, as well as a reception are for RVs. You can enjoy an exquisite view over the river Avon and over Clifton point a little more North, an iconic and imposing building in the city. The Clifton observatory and its cave are two unmissable activities in Bristol. According to legend, the cave was the dwelling of two giants, Goram and Ghyston, fantastical beings believed to have haunted the dreams of many children! When leaving Bristol, the route to the South of England Devon is waiting for you! Make the most of this route to stop over at Glastonbury, home to the renowned festival, but also to a vibrant new-age community that allows you to discover hidden ancient traditions of the UK as well as a good number of shops, each more original than the one before. The Devon region is a paradise for novice travellers, with a large proportion of its open paces devoted to campsites. Many different routes are waiting for you, whether it's by canoe, kyak or on foot, and the local wildlife will spark your curiosity! You can learn to surf or perfect your style at Croyde, surfing home of England (if you aren't already the next Kelly Slater! ), or eat some delicious fish & chips at the seaside. Devon is just waiting for you to unveil all its secrets. Manchester hosts many iconic monuments have rediscovered their former charm, especially the Corn Exchange, shopping centre known for its restaurants from all four corners of the globe, where you can discover new culinary treats! A walk through the second largest Chinatown district in England, will allow you to extend this culinary discovery to trying Yuzu or Chili that has become the most famous in the culinary industry. Once you're full, a cultural adventure is waiting for you. You can start by visiting the Manchester Art Gallery, which offers many events and is open late on Thursdays. More to the North, the Royal Exchange Theatre will satisfy your curiosity with a circular stage offering a new dimension to the plays performed there, as well as a friendly space that is pleasing to the eye, holding bars, shops and cafes. Renting an RV and travelling can occasionally be tiring, in which case a detour to The Circus Tavern, the smallest pub in Europe will perk you up with its warm and friendly atmosphere. It would be a shame not to cross the 34 miles that separate Manchester from Liverpool and miss the wonders that the city can offer you. The shining beacon of Merseyside is the biggest centre of culture after London, represented notably by the very modern Echo Arena or the Philharmonic Ochestra and its art deco character. The city is also famous as the birthplace of legendary music icons. Manchester gave birth to the brit-pop group Oasis, but many years before, it was the Beatles that emerged from the heart of Matthew Street in Liverpool. There, you can discover the The Cavern, mythical club where the Beatles had played over 300 times, visit The Beatles Story, museum dedicated to their history or even do the Magical Mystery tour in order to go in search for the iconic places.